BOC Governor Stephen Poloz and his gang of policymakers are set to get the ball rolling with their policy decision in tomorrow’s New York trading session, but these folks are widely expected to keep interest rates on hold at 0.50%. In their earlier rate statement back in January, BOC officials sounded surprisingly upbeat in saying that the crude oil situation could eventually turn around for Canada’s ailing energy sector. This triggered a massive forex rally for the Loonie, as policymakers also noted that the government’s fiscal policies might be enough to keep the Canadian economy afloat for the time being. 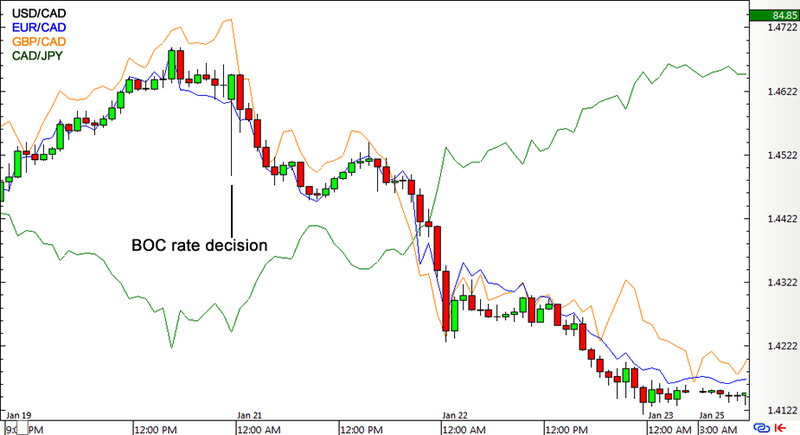 As you can see from the forex chart of the Loonie pairs above, traders had been pricing in a potential rate cut ahead of the event only to hear a relatively optimistic statement, which was followed by a strong CAD rally that lasted until the end of the week. This time around, BOC policymakers could also highlight the recent pickup in crude oil prices, giving themselves a pat on the back for predicting a recovery in their previous announcement. If so, the Loonie could go for more gains, although this scenario may have been priced in early already. Also, as I’ve noted in my Forex Snapshot of the Canadian Economy, business and consumer spending could still take a hit from the recent drop in oil but the latest trade numbers aren’t looking too shabby. Next up we’ve got the folks over at the RBNZ ready to announce their policy decision during the wee hours of the U.S. trading session. The consensus is for the central bank to maintain current interest rates as well, but some analysts have been pointing out that it’s about time for more stimulus. The main problem area for New Zealand is its dairy sector, as most of the Global Dairy Trade auctions so far this year have indicated falling price levels. This has prompted Fonterra, New Zealand’s largest company and dairy exporter, to lower milk payout forecasts in a few instances, weighing on farmers’ revenues. However, a quick look at the latest batch of quarterly data from New Zealand shows some green shoots in consumer spending, trade activity, and production. Now the RBNZ has already cut interest rates four times last year so central bank officials might be inclined to sit on their hands and wait for the monetary easing magic to work. 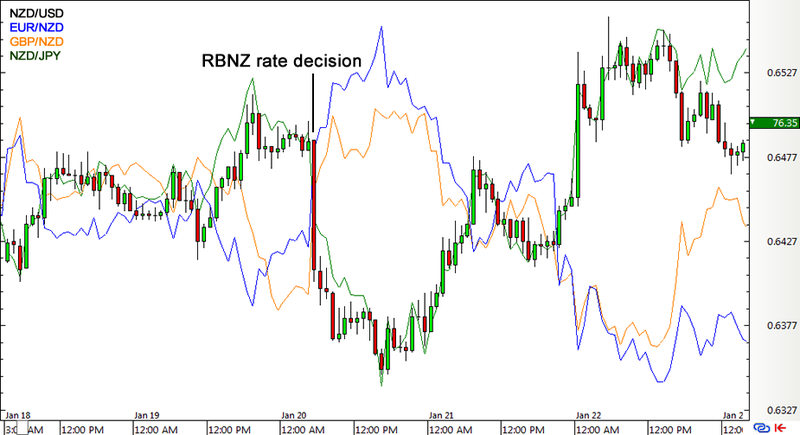 Their January statement triggered a sharp drop for the Kiwi, as shown in the chart above, when traders noticed that RBNZ Governor Graeme Wheeler kept the door open for rate cuts. Still, a decision to hold their fire for now could be bullish for the Kiwi, especially if policymakers sound hopeful about an economic rebound later on. Last but most definitely not least is the ECB, which is widely expected to ramp up their stimulus program this month. As Doomsday Draghi hinted in their January announcement and his speeches that followed, policymakers will reconsider their easing options and that their pockets are still pretty deep. 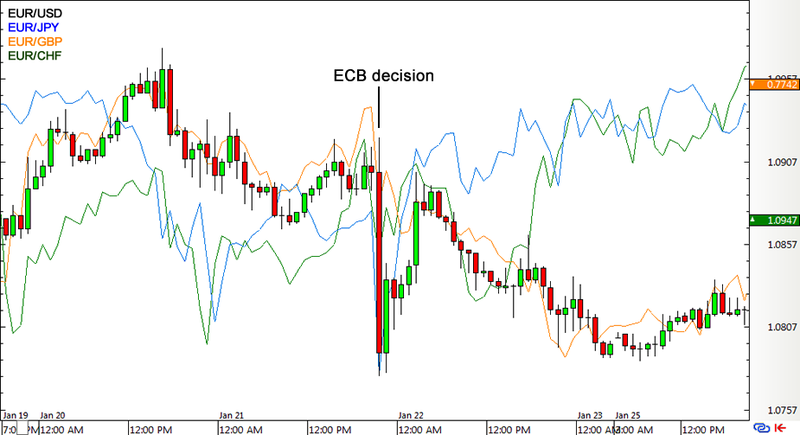 With the prospect of another easing extravaganza back on the table, the euro dropped by more than a hundred pips against its forex peers during the January ECB press conference. However, profit-taking was swift and euro pairs eventually leveled off, with EUR/JPY and EURCHF regaining ground for the rest of the week. I’m seeing a lot of red in my Forex Snapshot of the Euro Zone Economy so there’s a pretty strong chance of additional easing this time, but market watchers are still unsure about the size and scope of the program. The general consensus is for another deposit rate cut, possibly a bump up to its 60 billion EUR monthly asset purchases, and maybe another extension to its end date as the cherry on top. There you have it, forex fellas! Quite a lot, huh? If you’re a newbie trader or just not comfortable with these types of event risks, I would recommend sitting on the sidelines during the actual announcements then planning your next trade setups based on the outcome and price action. Good luck!